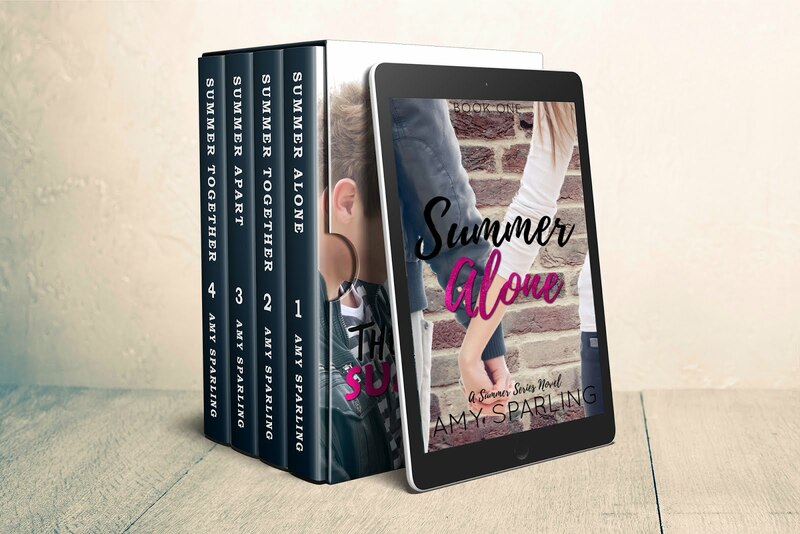 Official website of author Amy Sparling: The Summer Series Available now! The Summer Series Available now! The Summer Series features all 4 novellas told from Bayleigh's best friend Becca's point of view. It is a spin-off series from Summer Unplugged and it's now available for Nook, iTunes, Kobo, and Amazon! The entire Summer Series collection in one! From the bestselling Summer Unplugged series, comes the spin-off series based on Becca Sosa. Becca's senior year of high school is approaching and she's tired of being the dorky best friend. Determined to reinvent herself with help from Bayleigh, she plans to spend the summer breaking out of her shell. When Bayleigh gets grounded and sent away for three months, Becca's plans come crashing down before they've even started. Now Becca is alone and can't even talk to Bayleigh on the phone. Not wanting to miss out on the summer before senior year, she takes a job at the local indoor BMX track. The job is fun, her boss is laid back, and the place is packed with hot guys. One of them just might have a crush on her. This may be a summer without her best friend, but it doesn't mean she'll have to spend the summer alone. t's the summer after graduation and Bayleigh just asked Becca to be her maid of honor. Determined to give her best friend the greatest wedding ever, Becca has a lot on her plate. When she thinks she's finally got everything under control, a certain member of the groom's bridal party can't keep his eyes off her. Becca's not sure how to handle all the attention but she is sure of one thing: This will be a summer to remember. Becca survived her first year of college (barely) and now she's out for summer break. This would be an awesome time to hang out with her mega cute and famous motocross racing boyfriend, Nolan Park, but unfortunately for her, she just broke up with him. As much as she likes Park, she couldn't handle the emotional turmoil of having him go back home to California after every visit. The paparazzi are watching his every move and Becca doesn't like what she sees about Park online. She thinks the time apart will do her some good. She's never been more wrong in her life. Now that Park is a daily presence in Becca's life, she thought everything would be perfect. But Park gave up everything--his home, his job, and his friends--to be closer to her, and she can't help but worry if she's good enough to keep him happy. After all, there's one very intimate part of a relationship that she hasn't yet given him. But Park doesn't give up easily, and he's determined to make this summer one they'll remember for a lifetime.